Halloween is not even a week in the rear-view and I’m already dashing headlong into Thanksgiving preparations! It’s coming up in two weeks, people! This is not a drill! This morning in a fit of… something, probably lack of desire to exercise… I took down and put away all the Halloween decorations and replaced them with my meager Thanksgiving decorations. I love decorating for the season, and I really enjoy Fall Décor specifically, but I have a very hard time paying $25 for a wooden pumpkin, even if it’s handpainted, and even if I really like the pumpkin and pine for it each year at this time. Oh well. I keep it in my Etsy shopping cart for annual admiration, hoping each year that the shop will have a massive sale and I’ll be able to get it for $10. You know who has surprisingly good seasonal décor? Michael’s, that’s who. I usually spend a morning in early fall, or, as seasonal buying seems to begin earlier and earlier each year, in early summer, wandering through Michael’s, admiring the stuffed scarecrows and fabric owls and tabletop gourds. Would my life be vastly improved by tabletops gourds? Probably not, but I imagine them in my life just the same. I don’t really know what more I NEED, by way of fall decorations. I have a plain orange pumpkin that I use to bridge the decorating gap between Halloween and fall. I have a table runner with leaves. I have a small wooden pumpkin. I have a small wooden “gratitude tree” from which Carla hangs little paper leaves on which she’s written things she is thankful for. I have a wooden welcome sign for my front door in the shape of a leaf. I removed the jack-o-lantern faces from the pumpkins, so they are sitting on the front stoop, pretending like they were meant to be fall pumpkins and not Halloween pumpkins. I have two or three ceramic leaf bowls that I can never really figure out how to incorporate; they are not quite deep enough to be candy dishes, so I think I generally use them to hold cashews or pistachios when we have Thanksgiving guests. I have a plastic Thanksgiving plate and bowl for Carla, although she may be too big for them. I saved the fall window clings from last year. I have some small wooden leaves that I don’t know how to use – but I’ll find a way, mark my words; I used small wooden pumpkins on all the windows for Halloween and they are fall-ish enough to stay through Thanksgiving. I have a couple of fall hand towels. It sounds like more than it is. Oh! I also have a handful of colorful cloth leaves that I usually toss onto the Thanksgiving table. But this year, I used putty to stick them to my kitchen walls. What else could I possibly want, right? Especially because I am picky about decorations. I don’t like anything that’s made out of that scratchy material – what is it, sisal? I don’t like anything with words (my “welcome” door sign notwithstanding). I don’t generally like turkeys or pilgrims. Really, I’m a leaf and pumpkin girl, and I tend toward wood. And there are only so many wooden leaves and pumpkins a person can scatter about her house without feeling like they’re closing in. It’s not just the decor that has me in a frenzy; it’s the food. Thanksgiving is so early this year! My parents arrive a week from Friday, which is very exciting but also makes me feel a little panicked. I need to come up a meal plan for while they’re here. The one thing I know for sure is that we’ll have this chicken, mushroom, and wild rice soup for dinner the night before The Big Day. At least I have already ordered my turkey – which reminds me, I need to call and request that my turkey arrive a day earlier; DONE. – and I have dusted off my Thanksgiving Timeline. That helps a teeny little bit. I can’t really do much more until my first round of Thanksgiving shopping. I am feeling a little bit devil-may-care this year about the food. If you know me at all, you know that I am a Huge Kitchen Control Freak and do not like anyone else in the kitchen with me. But I am also realizing that I don’t actually like any of the food on Thanksgiving – except for the garlic goat cheese mashed potatoes and gravy, which I make by the bucketful – so why should I care so much about working myself to exhaustion while insisting on making the entire meal without ANY help from my family lovingly preparing it all on my own? My mother and father both like to help. Why not let them? Such a novel idea! However, jury’s still out on whether I will actually be able to turn over the reins. While I am throwing Thanksgiving caution to the wind, I am also contemplating doing things differently. Perhaps if I made a pie I actually like – apple, maybe! or a fall version of this plum torte that I have been dreaming about since I made it this summer – I would enjoy pie! Maybe if I made some sort of wonderful Brussels sprout recipe or a delicious mushroomy mac and cheese, I would be able to fill my plate with more than my traditional pile of mashed potatoes and a slim slice of turkey! This is not new; I have contemplated doing things differently in the past and then stuck with our family traditions. Therein lies the problem, of course: our traditions are so ingrained beloved that we’re not going to change them. Which means that I wouldn’t be lessening the cooking load at all. I am still going to have to make dressing, because it’s my husband’s favorite. I am still going to have to make pumpkin bars, because people want something pumpkin-y at Thanksgiving. And I don’t know that I have enough bandwidth – not to mention enough oven space – to add something else to the mix. So probably all this wild and reckless and altogether deviant thinking won’t go anywhere, and I’ll do what I’ve always done. It’s fun to think about, though. The one shake-up I am contemplating that stands the best chance of actually happening is the gravy. I love gravy so very much. And the last time I made it, it was amazing. It was this deep mahogany elixir of the gods that I would have been happy to drink by itself. But it’s finite, you know. And you have to share it with the other people at your Thanksgiving table. So I’m wondering if I might try to make some gravy in advance. I keep seeing suggestions for doing this, and it doesn’t look terribly hard. I mean, you have to procure chicken or turkey parts/carcass in advance, which troubles me a little. But I could probably buy some chicken wings or legs for not too much money and roast them for the gravy. And I would still make gravy on Thanksgiving Day, don’t you worry. This plan is designed to produce EXTRA gravy, not less work. I want to be eating mashed potatoes and gravy well into December, is what I’m telling you. Well, I have a little time left to fit it into my Thanksgiving Timeline. If it works out, I’ll let you know. I went to Target the other day, and the cashier totally Kristen Wiiged me during check-out. “What’s ‘Thai sweet chili sauce’? Is it spicy?” and then, “Well, I KNOW sriracha is spicy!” and, “Looks like someone is going to be a princess for Halloween!” and, “Love that color nail polish!” and, “Oooh, what’s this? A top coat? And you have coupons for both!” I don’t have a problem chit chatting with the cashier, and I am sure it is DELIGHTFUL to see the variety of things that strangers buy each day, but it was mildly uncomfortable to have her COMMENT on it. One thing the Target Lady did NOT comment on? My taco shells. I bought two boxes and all but SEVEN SHELLS were broken. WTF? Did someone at the store shake the box as hard as possible? Carla actually EATS tacos, so we have them at least once a week. And I have never — NEVER — seen such a thing. I mean, in the one box, not a SINGLE SHELL was whole. Well, I can bright-side my way to nachos for lunch, at least. Halloween was SO FUN this year. Carla is at the perfect age, I think. She got really excited about dressing up (so much so that the hours between the end of her school day and six o’clock when trick-or-treating began took forever) and she was really pumped up by the idea of candy. She understood the concept of going up to people’s doors and holding out her little pumpkin. She didn’t really succeed in saying “trick or treat,” but she DID say “thank you,” so there’s that. One thing I loved was that she would rummage around in people’s candy dishes, searching for the Perfect Candy. And some of them would helpfully choose something for her, and she would shake her head and say, “No, I have that already.” It was kind of adorable. Also a little bit embarrassing, but I’m choosing to believe that people felt more charmed than annoyed. We made it all the way down one side of our block before she decided that she needed candy NOW. Instead of going up to the door, she sat down smack in the middle of one our neighbors’ driveway and started searching through her pumpkin to find something. To prod her along, I pulled out a bag of M&Ms and fed her one at a time after each house, kind of like training a puppy to heel. So she would dutifully march up to the door, collect her candy, and then turn around and open her mouth like a baby bird eager for a worm. We went through a bag of M&Ms and one roll of Smarties. Our neighbors were so kind and generous. We have a great block, and most of the homes had full-size candies. And one of our neighbors was HIDING the good candy for the kids she recognized from our block, so when Carla finally made it to her house, she invited us in and gave Carla three full-size items. It was just so sweet. It made me feel giddy with the goodness of human kind. The one negative moment this Halloween was a comment that I got about Carla’s costume, from someone who knows us well. Carla was a princess this year; last year she was a superhero. She chose both costumes, without input from me or my husband. Just, last year she was really into the superhero, so she wanted to dress up like that particular superhero, and this year she really wanted to be the princess. First of all, gross. Second of all, what? Thirdly, REALLY?! Fourthly, why is anyone evaluating anything about the costume choices of a three-year-old? Fifthly, it makes me mad because – for a minute – it made me want to rip the princess costume off of Carla and dress her up like a lumberjack complete with beard and muscles (ALTHOUGH A LUMBERJACK COULD BE A PERFECLTY FEMININE PERSON TOO OMG) just for spite, and then THAT makes me mad because why? Why shouldn’t I just be delighted by whatever Carla wants to pretend to be, whether it’s a firefighter or a dragonfly or a ballerina or a freaking bowling ball. Why should some stupid comment make me want her to be or feel or do anything other than what she wants? WAY TO RUIN HALLOWEEN, PERSON. I don’t even care to unpack all that upsets me about that comment, or why it’s so gross and demeaning, or how it’s a symptom of a larger, more insidious problem in society, or how sad it makes me feel that Carla is going to have to face crap like this her whole life. So I’m going to write it down here and be done with it and move on. Now that Halloween is over, I suppose I have to put away my Halloween decorations. I am not particularly good at decorating for holidays, but I really come through for Halloween and Christmas. I have some cats on pumpkins that I love, and a cool ghost, and a little ghost family for the bathroom. And this year I also found (at Target) a bunch of inexpensive multi-colored pumpkins with glitter stripes and polka dots. There are other things, too. I don’t really feel ready to put all the stuff away yet. Maybe this weekend. I love how so many people go All Out with their Halloween decorations: zombies and ghosts and witches hanging out in their yards, pumpkin path lights, spiderwebs overtaking their shrubbery, graveyards sprouting from their lawns. I love it. Carla and I went for a walk a couple of weeks back and found a street where nearly every house had Halloween decorations, and it was so fun to point them out and discuss them together. I think it also went a long way toward making the holiday fun for Carla rather than scary. She seemed delighted by one neighbor’s human-size trio of glow-eyed witches and by another’s mechanized skull hanging from a tree. I’m glad it doesn’t freak her out. I suppose now that I have to get rid of Halloween decorations, I can concentrate on Thanksgiving décor… But I don’t really HAVE any Thanksgiving stuff, aside from a fall-themed runner and maybe a non-jack-o-lantern pumpkin that I can keep using. I’m not sure what I WANT, in terms of Thanksgiving décor. But I really WANT it. Do you have any Thanksgiving or fall-type décor that you just love? Why can’t I stop typing décor? And that makes me feel all giddy about Thanksgiving! I love this holiday! I can’t wait to pull out my Detailed Thanksgiving Timeline and start preparing for the meal. My parents are coming out for Thanksgiving this year, which should be super fun. I wonder if Carla will eat ANYTHING? Of course, thinking about Thanksgiving gets me all excited about Christmas and Hanukkah, which I bet are going to be FANTASTIC, Carla-wise, this year. She is really going to “get” the whole idea of Santa Claus and I know she loved lighting the menorah last year, so it will be even more interesting this year. I think she’ll be able to look forward to things in a way she hasn’t before. SO FUN. I have some tentative gifts picked out for a few people, but now I can start gift-hunting in earnest. I also really want to get a tiny tree and some Christmas window clings for Carla’s room – she loved having her own Halloween decorations, so I think she’ll really enjoy Christmas ones, too. I have already put on the calendar our local Christmas tree lighting and food bank donation day, as well as our local menorah lighting. Maybe we will try to do a Santa Claus visit this year, too, if Carla is up for it. So those are fun things to look forward to. Speaking of gifts (which I was, a while ago), my father-in-law AND father both have Major Birthdays this year. My father-in-law is first. And I am wondering, what the hell do you get to commemorate a major birthday for men who have EVERYTHING? Everything I think of seems either lame or completely out of the realm of possibility. Ideas? Anyone? It’s a little hard to imagine Christmas with the unseasonably warm weather we’ve been having. I mean, we’ve been sleeping with the windows open and it’s NOVEMBER. On the one hand, this is awesome and I don’t want to waste it. On the other hand, I really want to wear the new vest and boots I bought, and I have a bunch of cute sweaters that aren’t being worn. So get with it, Actual Fall. At least the trees are super beautiful. It’s so hard to believe that this nice weather is actually happening that I haven’t really been taking FULL advantage of the warmth. When it’s not raining, that is. I feel like I should be going for long walks outside with Carla. We have gone to the playground, a LOT, so that’s good. And she’s been playing in the back yard a bit, which is great. Okay, I suppose we also decorated pumpkins outside, and we’ve done chalk drawings on the driveway, and we did our Halloween Decoration Tour. So we’re not completely failing. But I kind of feel like I should go full on It’s Still Summertime, and put the patio cushions back out and fire up the grill more often. My parents got me a meat grinder for last Christmas, and so far I’ve only been using it to make ground beef for tacos and chili. Freshly ground meat is SO GOOD. But the clean up is a little gross. When really the BEST use would be for hamburgers. I think what’s holding me back is that it’s usually so dark by the time my husband gets home, that grilling isn’t particularly pleasant. We have a light on the grill, but it’s not particularly useful. Hmmm. Perhaps a really powerful, useful grill light would be a good candidate for a Christmas present?? All right, Internet. That’s all I have for today. What’s going on with you? I recently had an epiphany: While I really enjoy being active – walking, even on a treadmill – I really dislike exercising. I’m fine if the exercise is inherent in the activity, but I don’t like to purposefully encourage sweating and ragged breathing. Eh. Know thyself, right? My in-laws donated a Crate and Barrel outdoor loveseat to us. It’s teak and sturdy and fits neatly on our back porch. But there’s no cushion and I cannot for the life of me find a cushion for it. The sizing is weird – leave it to Crate and Barrel to have custom sizes, right? – so none of the standard bench or loveseat cushions at Home Depot or Target or Bed Bath & Beyond will fit. Then I looked at Crate and Barrel for a replacement – they were having a sale – and the appropriate cushion would cost $500. On sale. I know we all have different categories of things we are willing to spend serious money on, and it turns out that an outdoor loveseat cushion is not one of mine. I have made a career change, and I am LOVING it. I feel like I should acknowledge it here, but I don’t want to go into detail right now. So. That’s all. My niece’s first birthday is next month, and I have no idea what to get her. Her parents always get Carla fun educational toys, so I suspect they might enjoy getting one of those… but they also live in a tiny apartment and I don’t want to send them anything that requires too much space. Clothes are out: not only does my niece get ALL of Carla’s hand-me-downs, but she also has the same grandmother that Carla does, which means she gets her own beautiful collection of clothing. I just finished the third (and so far final) Cormoran Strike book by Robert Galbraith (J.K. Rowling). I found all of them thoroughly enjoyable, but now I’m looking for the Next Great Mystery Series to start. I like Sue Grafton and Tana French and Kate Atkinson and Sophie Hannah. But I haven’t really found any other series that have the kind of writing and characters and types of crimes that I like. So in the meantime, I have finally begun A Little Life, because I’ve heard it’s a life-changing work of fiction. But I’m very apprehensive about it, because I’ve heard that it’s devastating. We have lived in this house for nearly five years, and we are FINALLY getting to finish the office. We’ve re-organized the furniture and gotten rid of a bunch of junk and now just need to clean out the closet (old computers and cellphones dating back to COLLEGE and assorted other tangentially-office-related detritus) and put up artwork. We’re keeping an eye out for coupons at Michael’s, so we can finally frame my husband’s degrees, and we’ll hang those as well (my mom framed my college degree; I don’t think I ever got a physical diploma from my grad school, seeing as I absconded to Europe instead of attending my graduation ceremony). Speaking of junk: we had inherited three mattresses and two bedframes from my in-laws that we finally got rid of. Alongside a massive, defunct television set, a DVD player, and some other piece of stereo equipment that is no longer compatible with modern TVs. I felt TERRIBLE sending these things off to the junk guy, but our local Goodwill had no interest and I am not holding a garage sale. This seems worth remarking on: I had been saving, on my DVR, the final episode of House since it aired in 2012. I never watched it, because I don’t like things ending. (We still have the Parks & Rec finale, unwatched, on the DVR as well.) But we were running out of space on the DVR (wonder why?) so I finally deleted it. If I haven’t watched it in four years, it is unlikely I ever will. If You Have Strong Opinions About Gliders, This Post Is for You! Internet, I need your advice. When planning for our nursery, my husband and I knew that we would want a chair of some sort for reading and breastfeeding and general cuddling-and-shushing purposes. We went into the nursery-planning process with the idea that we would buy as much transitional furniture as possible. We have a guest room established, and an office, so we figure this will be The Baby’s Room for… until The Baby has turned into The Sullen Teenager. We (or actually my far-too-kind-and-generous parents) got a crib that is one of those “Lifetime Sleeping Apparatus” things that adjusts to a toddler bed and then can be easily converted into a full-size bed down the road. Instead of a “real” changing table, we (again, my wonderful parents) got a dresser that has a changing table attachment. That way, the kiddo will transition nicely over the years from diapers and burp rags to snarls of underwear and mismatched socks and Whatever-the-Kids-Wear-in-the-Future. We wanted to apply the same “transitional” thinking to our choice of chair. So we found a beautiful arm chair at Pottery Barn Kids that starts life as a glider and has feet you can install down the line (sold separately) to transform it into a regular old armchair. Of course, it also comes with a price tag that will make you consider taking up carpentry just so you can build your own chair instead. But, honestly, I have no idea what to pay for a stupid glider, and it seems comparable in price to other gliders out there. I shared our choice with a few people, and one mom suggested that such a sinky, comfy chair might pose difficulties whilst holding a sleeping baby. Namely, that it might be difficult to RISE from the chair with a baby in my arms. Sounds reasonable, and it was something I hadn’t thought of. I didn’t have any spare babies lying around, but the next time I was in the area, I stopped by the PBK and sat in the chair with my purse cradled in my arms (football hold style) and tried to get up. It wasn’t… impossible. But it wasn’t… easy. Then again, I’m not sure it would be easy EVER. In any kind of chair. Barring a chair that could mechanically stand me up and push me out of it, that is. My stomach muscles aren’t really working as well as they have in the past, after all. Otherwise, the chair was still lovely: comfortable, with thick padded arms and that nice rocking feature. There’s an optional ottoman you can get with it (for another arm and a leg). 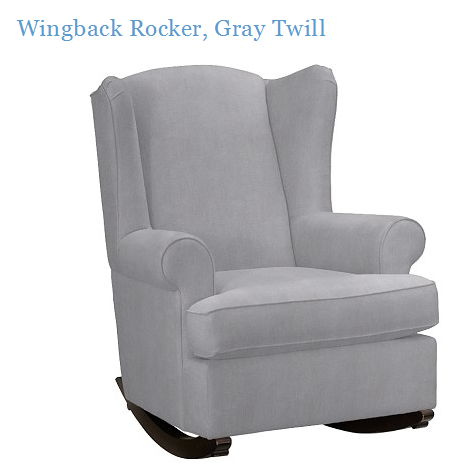 The wingback style is nice because you can rest your head against the “wings” and take a little snooze. I mean, that’s what happens when you stagger out of bed in the middle of the night to feed your child, right? Snoozing? What do I know. Anyway, once I had the idea planted in my head that this chair maybe wasn’t ideal, I started looking around. The first thing I noticed was that these armchair-style gliders are POPULAR. In fact, it’s difficult to find NON-armchair type gliders. At least in the three stores we visited. Which… please don’t make me go to more stores. The three I’ve visited are overwhelming enough. But, while they are still ridiculously expensive, they are LESS expensive than the PBK armchair. 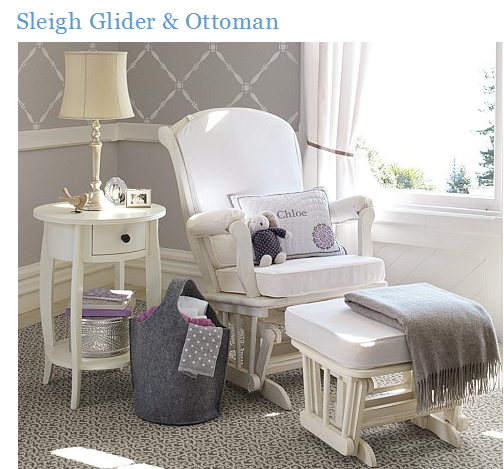 And then another mom pointed out that THIS version of glider has lots of moving parts. Which would be dangerous for little fingers. So now I have visions of our poor baby’s mangled hands floating through my already-anxiety-addled brain. 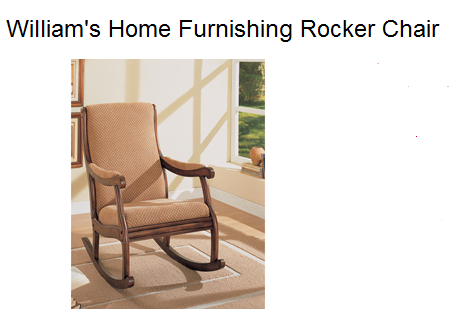 It seems like there is a third version: the Straight-Up Rocking Chair. But Internet… I don’t know. This chair looks functional.I don’t find it… UNattractive. It just… I just can’t picture hours of cuddling in that chair with my baby. I can’t picture us curling up together to read Babar’s Travels or Corduroy or Goodnight Moon. I can’t picture myself feeding a snuggly sleepy infant – comfortably – in that chair. And I certainly can’t picture myself getting a few more winks in while the baby – safely – finishes a meal. As with all things related to babies and parenting and the seemingly endless array of Things You Just MUST Have, this glider decision is fraught with so many issues! Safety! And Comfort! And Cost Effectiveness! And Functionality! And Durability! And Other As-Yet-Unconsidered Considerations! And and and! But YOU. You MUST have The Perfect Glider Answers to all my glider questions, right, Internet? What glider did/do you use? Why did you choose it? Why did you choose NOT to get other versions? Are there options I’m overlooking here? Do you think it’s smart or foolish to try to buy furniture for the baby that will last for the next decade or so? Do/did you use your glider after the baby grew out of it? What, for the love of cupcakes, is an actual REASONABLE price to pay for a glider? And WHY, WHYYYYYY is everything baby-related SO EXPENSIVE? Let’s Talk About My Fireplace! Oh my gosh, hello! How wonderful to see you! I wasn’t expecting company today – thank you so much for stopping by! Would you like to come in? The place is kind of a mess these days, but at least it’s warm. Hungry? 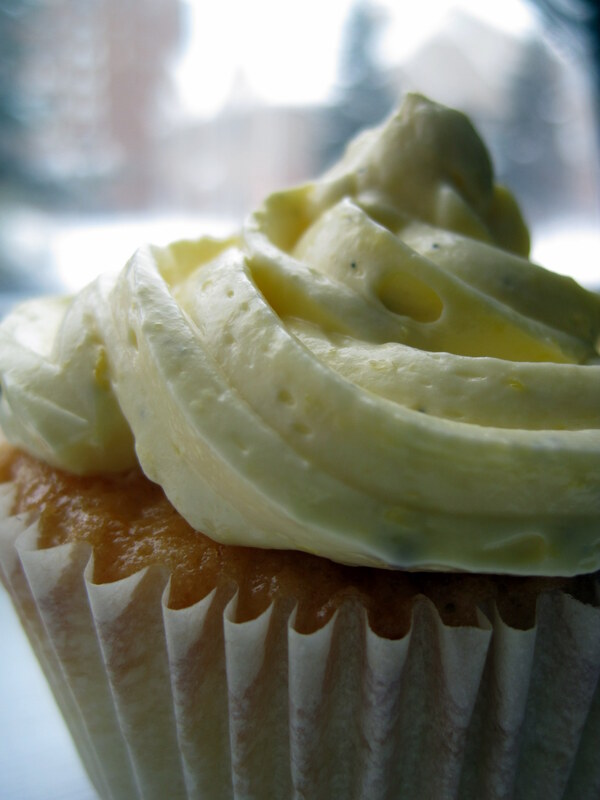 I can’t eat sweets, but I’d love to watch you eat my favorite cupcake of all time. Lemonlicious. I am so going to eat 10,000 of these bad boys in February. No? You just ate? Well, you have admirable self control my friend. But I feel like I’m failing at my hostess duties if I can’t force you into consuming something. Can I get you a drink? 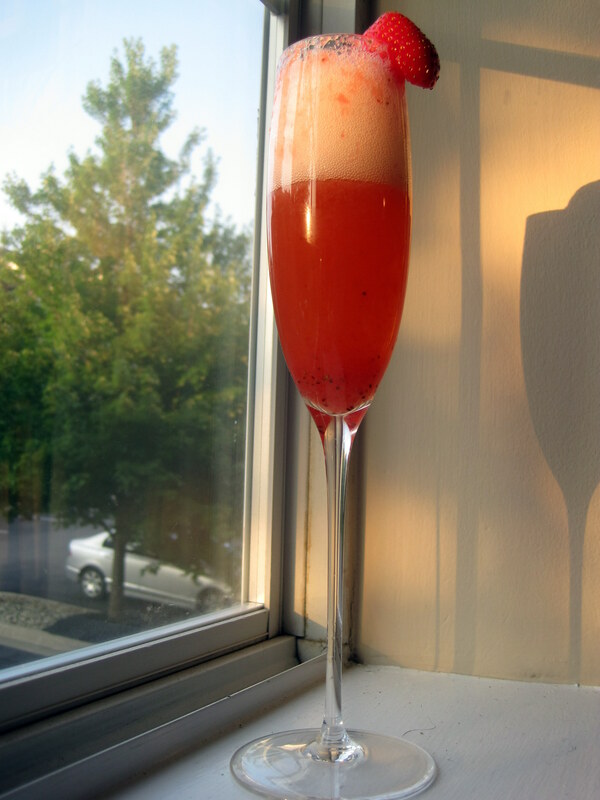 I may have a strawberry Bellini lying around. Now that you’re nice and liquored up, can I get your opinion on something? Please, let’s head into the living room. Right this way. That's not our furniture. Or our clock. Or our giant TV. 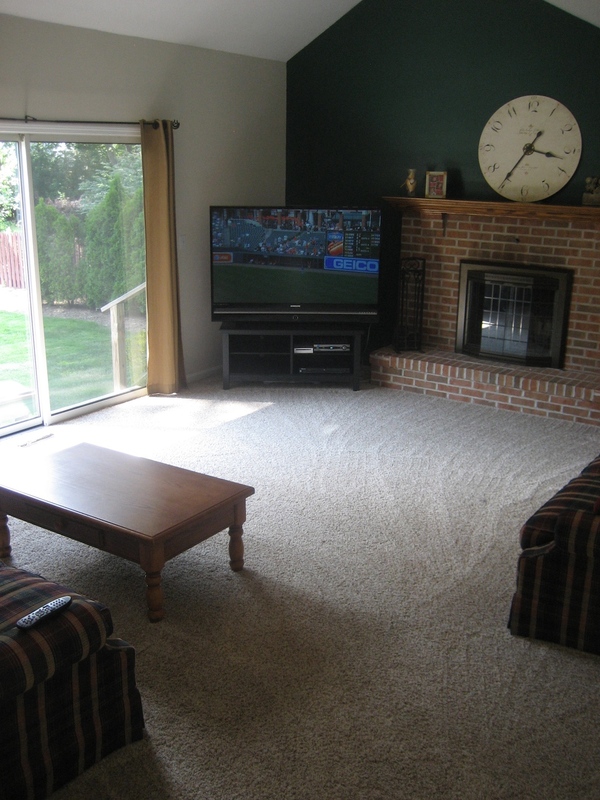 Or our freshly vacuumed floors. Let’s talk about my fireplace. I know. The dark green wall has GOT to go. But don’t worry – we’ll figure SOMETHING out! And we’ve already got the replacement paint color picked out. It’s called “Hinting Blue” from Sherwin Williams. Oooh! Aaaaaah! The caption is twice as big as the swatch! But let’s try to ignore the wall and focus on the fireplace. Still not our furniture or giant clock. Man. 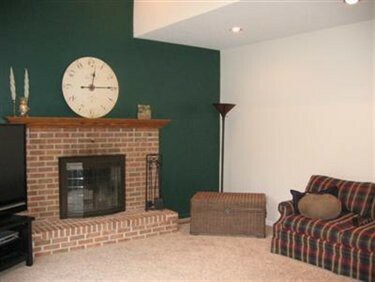 The clock and the TV make the fireplace seem much less huge than it is. Perhaps I need to invest in a giant clock? It’s lovely. But… it’s kind of hideous. I mean, it’s SO HUGE. And so very… bricky. 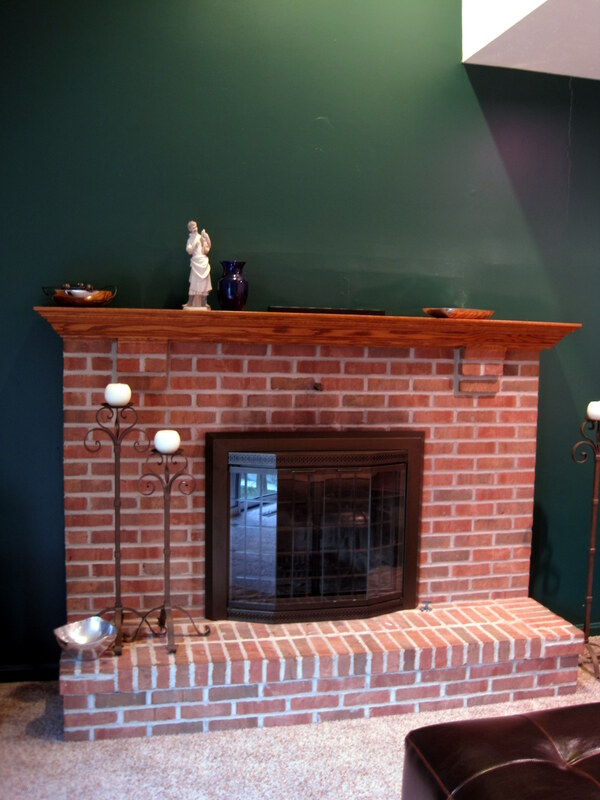 If I had magical powers, I would paint the brick and mantle white, I’d add tall light-giving windows to either side of the fireplace – like this or this – and I’d find a classy way to mount a (bigger than our actual TV) flat screen TV above the mantle. No, I really think it can be done in a classy way. Okay, we’ll have to agree to disagree. Anyway, since I am neither a successful coke dealer nor the inventor of actual Coke, the windows will have to wait. Unless you have a brilliant and cost-effective way to insert windows into the side of a house? But I do still have dreams about painting the entire fireplace white. No, I have no idea how to paint wood OR brick. But! I have been pinning a lot of white fireplaces on Pinterest! Didn’t you know that if you pin enough images that you unlock a level where little robots climb out of your computer and do your every bidding? I’m thinking that I can get away with just painting the mantle. You know, if I can figure out how to do that. I’m envisioning a result like this. Of course, our fireplace doesn’t have that same kind of fancy wood surround. Those knick knacks are mine. Don't you love the artfully casual way they are strewn about the mantle and the hearth? Maybe it will look less awful once the green paint is a distant memory? Oh, you’re so sweet. Thank you for saying it isn’t that bad. I know one girl’s ugly fireplace is another girl’s beautiful focal point. I just need to find an easy, cost-effective way to DO THAT. Well, it looks as though you’ve finished your drink. And I really should get back to work. Shall I show you out? If you have any thoughts about what to do with this monstrosity, or any ideas for general fireplace sprucing, give me a ring. It was lovely to see you. Thanks for stopping by! You are welcome in my home any time!